Happy summer! It's been more than a year that I've shared anything here. I didn't mean to take such a long break. And rather than bore you with all the details or reasons as to why I haven't shared anything, I figured I would just jump right back in. The activities in my manifesto are usually pretty simple. "Go the the library" is a favorite. My love for the library is real. Going to the library in the summer is especially rewarding because our library has a weekly, kids' and adults' summer reading program. It makes me very happy that my daughters enjoy going to the library and reading as much as I do. The manifesto activities can also be more elaborate. For example, one year we stayed at the colorful Saguaro Hotel in Palm Springs for a few days. 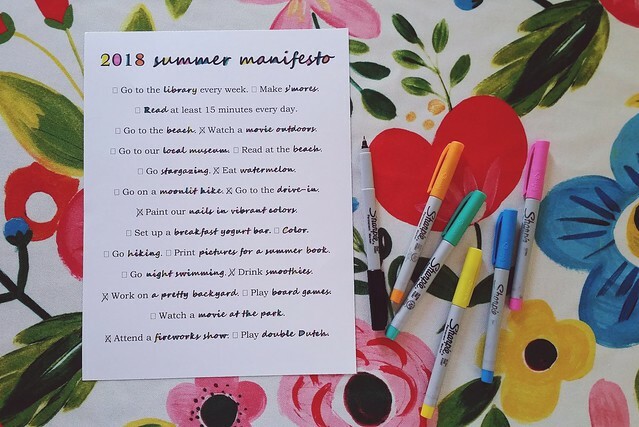 Shutterbean's Summer Bucket List 2018; The Frugal Girl's 2018 Summer Bucket List; Wellness Mama's 2018 Summer Bucket List: Fun and Frugal Summer Activities. Go to the library every week. Read at least 15 minutes every day. Go to our local museum. Go on a moonlit hike. Pain our nails in vibrant colors. Set up a breakfast, yogurt bar. Print pictures for a summer, memory book. Work on a pretty backyard. Watch a movie at the park.